Lone Signal's website will let Earthlings submit messages for transmission to Gliese 526, a potentially habitable solar system 17 light years away. Would you pay 25 cents to send a tweet to space on the odd chance that an alien might read it? The founders of Lone Signal hope so. The New York startup is launching a new website through which anyone can submit messages that will be broadcast to a star 17 light years away. The messages will be sent from the fabled Jamesburg Earth Station, a satellite site that was first built to support the Apollo 11 moon mission. The property, which includes 160 acres of prime real estate in California's rural Carmel valley, is now privately owned, and Lone Signal has secured a 30-year lease on its satellite equipment. But Lone Signal has a more ambitious goal. If the current project sparks enough interest around the world, the company hopes to eventually raise the kind of money required for a full-scale continuous transmission project -- an effort that would cost an estimated $100 million and require satellite dishes in each hemisphere. "The only way to do that would be to interest the private sector in the same way that Space X has brought the private sector into space exploration," says Jamie King, Lone Signal's CEO. That's the goal of Lone Signal's text-messaging project: to generate mass-market interest in the concept of communicating with aliens. When Lone Signal's website launches to the public on Monday evening, anyone will be able to post one 144-character text message for free. After that, they can purchase four "credits" for 99 cents, which buys four text messages. The messages are being beamed to Gliese 526, a potentially habitable solar system that is relatively close to Earth. In addition to the text messages, which can be written in any language, Lone Signal will simultaneously send a message written in binary code -- the language computers use to communicate -- that contains basic principles of physics. The idea is that these principles apply throughout the universe and thus are more likely to be understood by an alien than, say, a text message written in English. That message was developed by astrophysicist and planetary scientist Michael W. Busch, a fellow at the National Radio Astronomy Observatory. Lone Signal's executives are a diverse bunch who got together based on a shared enthusiasm about the possibility of communicating with creatures from other planets. King is a cofounder of Rockstar Games, the company behind the bestselling "Grand Theft Auto" series. The company's other creators include a fashion photographer and a video game developer. Ray Kurzweil, a well-known figure in the tech community who is a director of engineering at Google (GOOG), was given early access to the site and queued up a message. 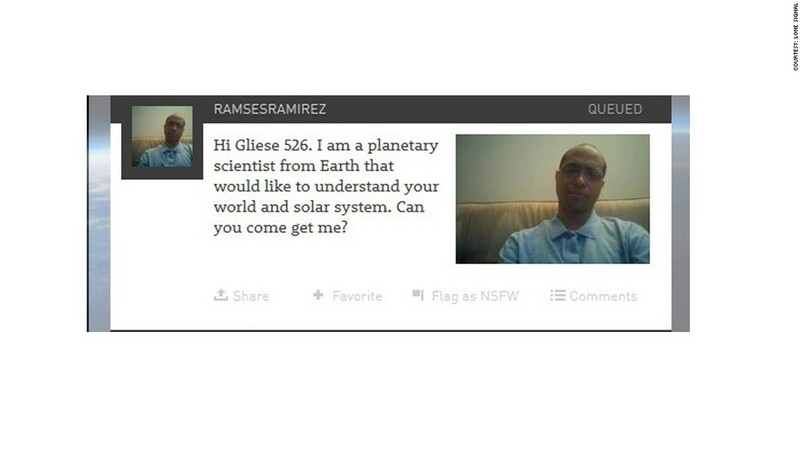 It reads: "Greetings to Gliese 526 from Singularity University. As you receive this, our computers have made us smarter, the better to understand you and the wisdom of the universe." The site has a few neat features. Users can dedicate a message to someone else and track their messages, watching in real-time to see how far each has travelled. Site visitors can read other messages that have been sent. Lone Signal plans to send periodic emails to users when their messages hit milestones. The executives wouldn't say how many paying customers they'll need to keep the operation running. For now, the sole investor in the project is Greg Kadel, the fashion photographer who first hatched the idea with company cofounder Pierre Fabre. "We think we're running a very lean operation, and a lot of us are actually working gratis," King says. The project's expenses have included an upgrade to the equipment at Jamesburg, which hadn't been used for years, plus the ongoing costs of paying for an on-site engineer at Jamesburg and maintaining Lone Signal's website. But Long Signal points out that we've already done a good job of broadcasting our existence. "The scientific community is well aware that we've been transmitting radio waves that are detectable at these distances for 70 some years," says Jacob Haqq-Misra, who serves as chief scientific officer for Lone Signal and holds a Ph.D. in meteorology and astrobiology from Penn State University. Radar, TV, satellite, cell phones and even city lights emit signals that travel into space. "Astronomers and astrobiologists and scientists are in agreement that our location is not a secret if anyone wants to look for us," he says. Lone Signal just wants to give that "hi, we're here!" beacon a boost.